Capcom this morning sent over details for the free Ultimate Marvel vs. Capcom 3 – Heroes & Heralds DLC that is now available for download on the Xbox 360 and PS3. They have also confirmed that the Heroes & Heralds mode will be included in the PlayStation Vita version of UMvC3 as a standard feature. And for those you want to see the Vita version in action again, today’s your lucky day as Capcom sent over a new trailer for the game as well. 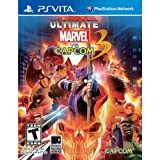 Ultimate Marvel vs. Capcom 3 is scheduled as a North American launch title for the PlayStation Vita. Read on for more details on the free Heroes & Heralds mode DLC. The free Heroes & Heralds mode DLC for Ultimate Marvel vs. Capcom 3 on PS3 and X360 is available today for download. In addition, Capcom is pleased to confirm that the Heroes & Heralds mode will be included standard in the upcoming PlayStation Vita version of Ultimate Marvel vs. Capcom 3.